Your needs for ramping, transfer lifts, or stair lifts may be temporary or for an unknown period of time. BILD offers flexible Rental options for Transfer Lifts (including power hoyer lifts and sit-to-stand lifts), Modular Wheelchair Ramps, Portable Wheelchair Ramps, and Stair Lifts for the home. We offer flexible options for temporary situations – please call us regarding rental options and pricing at 262-671-2032. In addition to our rental options for these items, we often offer financing options or rent-to-own programs for mobility and transfer equipment. Many of our transfer lifts are available to trial at our accessibility showroom at 9209 W Bluemound Road, Milwaukee, WI 53226. Let us know if you’d like to come and see or trial a lift prior to a rental. BILD Provides rentals of Modular ramps which provide sturdy railings, landings, and customized options. Rental cost includes installation/removal and monthly rental amount which is based on ramp size. Modular ramps are perfect for temporary rental situations as they are non-destructive to the existing layout of the home. Modular ramp systems are more heavy duty than portable ramps, and they include railings and landing options which improve the safety of the home setup. 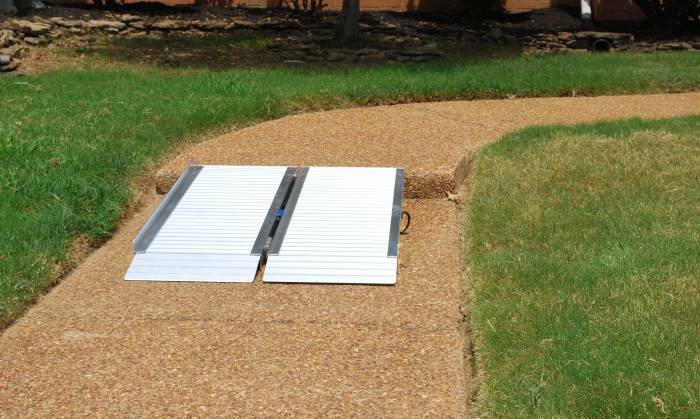 BILD offers options for portable folding wheelchair ramp rentals and sales for up to 10′ in length. We offer options for delivery of portable ramps or or pickup at our Milwaukee office. Portable wheelchair ramp rentals work very well for small stair rises of 1-2 stairs, and we can discuss other ramp or lift options if you have a higher height to enter the home. Call today for rental pricing and options! A manual sit to stand system, provides a very safe and contained space for an individual to pull up to standing while their knees are blocked, and then becomes a mobile seat that can easily be moved within the room or to the bathroom. An optional trunk strap is available to assist with stability. Various models are available and provides safety and mobility with ease for the caregiver. We have demo Sara Stedy transfer lift, in addition to other sit-to-stand transfer lifts, and power hoyer lifts that can be rented from our Milwaukee Accessibility showroom. BILD provides power hoyer lift options with individualized slings and configurations. We provide specialized slings options, portable and foldable hoyer lifts that will stow away for storage or for travel. Come and see the power hoyer lift options before you rent, at our Milwaukee Accessibility Showroom. Different power sit to stand transfer lifts vary greatly in their ability to support individuals depending on their physical or neurological condition. BILD offers a number of different sit to stand lifts including traditional power sit to stand models, the Arjo Sara Plus, and the Molift Quick Raiser power sit to stand. Our on staff physical therapists can assist you with finding a sit to stand transfer lift that will work best for your needs, and for your caregiver. You can come and see the transfer lifts and test them out in our Milwaukee Accessibility Showroom. BILD offers straight stairlift rental options that can be used temporarily for access to your indoor or outdoor stairs. Straight stair lifts mount directly to the floor and thus can be easily installed and removed. Installation of the stair lift secures to the floor treads of the stairs, and does not require any mounting to the walls. In addition to stairlift rentals options we provide solutions for rent-to-own as well where funds can be used towards a final purchase of the stairlift. Feel free to test-ride your stairlift at our Milwaukee Showroom before purchasing, and see our mobility lifter – caregiver assisted stair climber, which is another rental option which allows a caregiver to assist their loved one up and down the stairs with a lifter chair. Please call our lift specialists today for a free consultation on the many assisted transfer options available to you. Only BILD offers the most highly trained accessibility specialists (CAPS, CEAC, ECHM, CLIPP certified) who have backgrounds as experienced occupational and physical therapists. On top of that, we are national experts who teach accessibility professionals on the topic of remodeling and accessibility options. Our unique, integrated approach and consultations with our clients, project managers, and tradesmen produce exceptional attention to detail and ensure your safety and independence.